It's huge, and I plan on leaving it, but I would like to know what it is so I know when to trim it etc. Thanks, I've included 2 pictures, one of the flowers it produces (which are quite messy when the petals drop) and the leaves, some are green and some are a rust/red color. Sorry I had to put links, I couldn't get the photos to post on the forum. This is a bush/shrub? You're in California, so I'm probably wrong but the leaves remind me of Wild Black Cherry (Prunus serotina). The flowers with the red stems doesn't quite match though. Yeah, it's a bush, and I don't think the wild black cherry is right, I looked up some pictures in google, and my plant is much more bush-like than the wild black cherry. Also, the flowers are tiny, I got up really close to them for the picture, but each bunch of flowers is about softball sized, and each flower is slightly smaller than a pencil eraser. Also, it never fruits, the petals fall off, and the flower bunches just dry up. 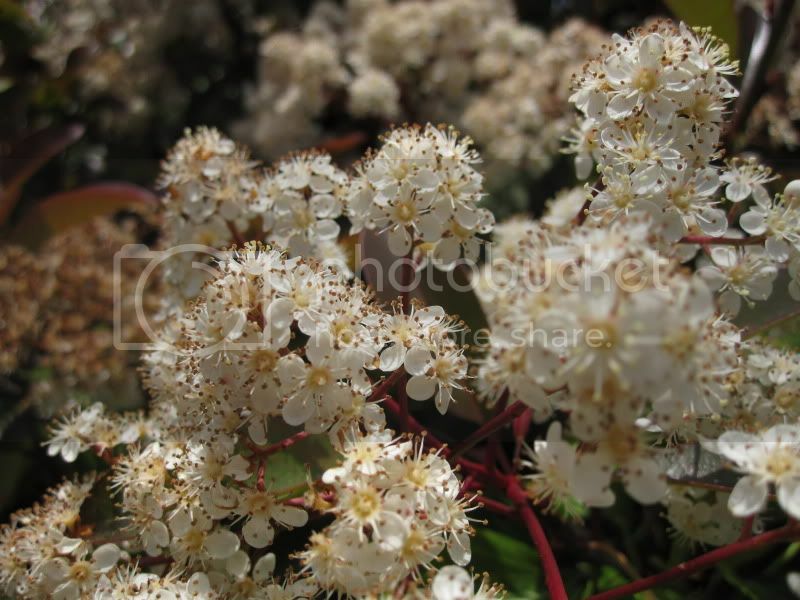 Perhaps one of the many species of Photinia? 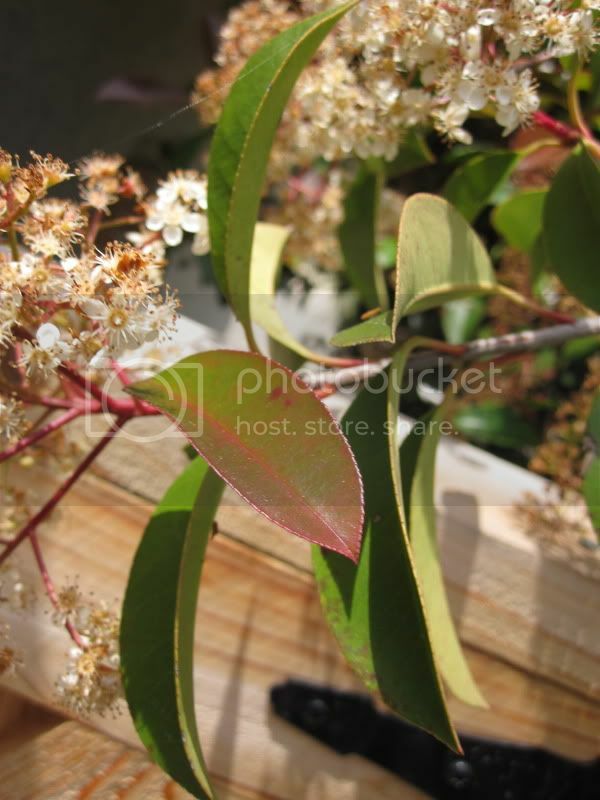 Kisal, after looking it up on google, I think you are right on the money, I think it's a red tipped Photinia. You're welcome. I'm terribly allergic to the pollen! Oh that is definitely a redtip...I only needed to look at the first pic to see that. They are everywhere around here...very overplanted in fact. They will get diseased easily, and grow very very fast when happy, so make sure you prune regularly! Can you help me identify this tree or bush? Can someone identify this flowering bush?